The Autism Society of Greater New Orleans, an affiliate of the national Autism Society, invites you to become a Sponsor of our 15th Annual Autism Awareness Festival (previously a Walk) which will be held on Saturday, April 6, 2019 at First Baptist New Orleans, 5290 Canal Blvd., New Orleans, LA 70124. As you can see below, Sponsorship Levels are quite affordable and are tax deductible as we are a 501(c)(3) nonprofit organization. Each year, 1 in 59 children are diagnosed with Autism. The Autism Society of Greater New Orleans holds an annual Festival (previously a Walk) not only to help raise awareness about Autism, but as our main fundraiser. Funds raised by the ASGNO are spent in the greater New Orleans area specifically to help children and adults with Autism and their families. For instance, each year we offer our mini-grant program to families and teachers to purchase materials and resources they need to support their child or student with Autism. We also started a Family Game Night in Slidell and New Orleans. Additionally, we provide information and referral to over 1,300 families and professionals who contact us for support, subscribe to our Email list, use our local resource directory, and visit our Facebook page and website. 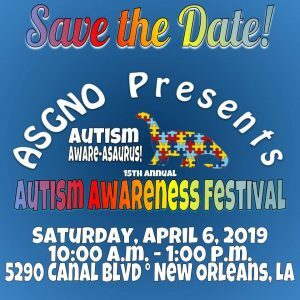 To become a Sponsor for our 15th Annual Autism Festival please click the button below to fill out the registration form, submit a copy of your logo by emailing it in .jpeg format to info@asgno.org, and either mail your check payable to the “Autism Society – Greater New Orleans,” P.O. Box 7028, Metairie, LA 70010 no later than April 6, 2018, or submit your payment online by using the button below. Please note: Online Payments will be subject to a 2.2% convenience fee. Adaptive Swim Lesson Guide for GNO Area! Brushes, Buddies, & Beyond for Autism and Other Disabilities in Chalmette, Metairie & Belle Chasse! Copyright © Autism Society of Greater New Orleans.